THIS IS TRULY A RESORT CLASS GOLF COURSE HOME. From its awesome views of the sixth hole of the Gold Course to the many amenities inside and outside. Soaring ceilings, fully furnished, 2300 Square Feet of private spacious living in a resort-style home in an 'Oasis in the Desert' called Ocotillo. Inside, this home has room for the whole family. The bedrooms have their own bathrooms and are split from one another. The living space has a family room with a Big Screen TV, a living room with an eight foot pool table, and a loft with sofa bed and another TV for the kids or adults to get-away. A desktop computer with cable high speed internet access and wireless access are provided. Outside, there are panoramic views of water and golf course from either the upstairs balcony or downstairs patio. The balcony has its own patio furniture and is accessible from the Master Bedroom or the spiral staircase from the lower patio. The lower patio has table and chairs and lounge chairs for sunbathers. Just off the patio is nestled your own private heated pool and spa. Also, this lower patio has a huge built-in flagstone entertainment area with chiminea fireplace and barbecue. Ocotillo is a 27 hole Championship course rated four stars by Golf Digest and selected as one of the three 'must play' courses in the Valley by its readers. Lush and green, with lakes and streams that meander through its gently rolling hills, Ocotillo Golf Club is distinctively different as an Oasis within an Oasis. In addition, your home is located in a great location to enjoy all of Phoenix and Arizona. Only five minutes from the nearest freeway, you will be only 20-25 minutes from either Phoenix Sky Harbor or Gateway airports, 15 minutes from Tempe, 20 minutes from Scottsdale, 75 minutes from Tucson, 2 hours from Sedona, 2.5 hours from Flagstaff, 4 hours from the Grand Canyon, and only five minutes from the Chandler Fashion Center shopping mall. A very enjoyable weekend! The house was even better than advertised with every imaginable amenity. The back yard pool area was awesome. The golf course was fantastic! One of my top 5 courses played so far in Arizona, not a desert course, with million dollar houses lining the fairways and water on almost every hole! We will definitely be coming back. Thanks Becky! We have been to coming to Colorado Rockies spring training for 7 years. Virtually each year we have improved our location and amenities as to the house we rent. This one is the ultimate and we are going back and don't foresee changing in the future. The house is great but the amenities and view are fantastic. Also, easy to access the major highways in the area. In general, the Ocotillo area is simply beautiful and the golf course spectacular. We have played many of the courses in the South East of Phoenix area and this is the best by far. Owner is very easy to work with. Our golf foursome stayed in this great home for a week. Excellent location as we played different courses every day and were able to find plenty of options within 30 minutes or less, with easy access to the 101, 202, and I-10 if needed. The pool and patio area was fantastic, as were all of the amenities of the house. It was great to have the open space of Ocotillo over the back fence. Becky communicated very well with us- before and during the trip. We wouldn't suggest anyone planning to use the sofa sleeper for anyone other than a small child. Everything felt very usable (we've been to some places where you are afraid to sit on the white chair or formal couch) and homey. Our group would certainly rent this home again if it's available on our next trip. Five family members stayed in this home for a week and had a great time. The home is exactly as described, and was clean and well-maintained. The heated pool and spa were very comfortable and we were in the water each day. The entertainment area outside was beautiful, and there is an outdoor patio heater that we used if the evenings were a little cool. The kitchen had everything you would want in a home. Becky was easy to work with, and we had access to her as well as to a local caretaker if we had any issues (which we didn't). It was great to get away from the Minnesota winter and this home worked very well. Overall a very good experience for us. Beautiful and goergous backyard with a perfect view of the golf course,pool ,and Palm trees! Absolutely perfect and cozy accommodation's inside! Will definitely come back! Thanks for your review. Glad you enjoyed your recent stay at our home. We have stayed at a number of VRBOs in in the US and abroad and Becky's home is one of our favorites. The accommodations are exactly as listed so there were no surprises. The home is clean and comfortable and the kitchen is very well equipped. Lots of towels for the pool and the temperature of the pool and hot tub were perfect. We are golfers so being on a course as nice as Ocotillo was an extra treat. 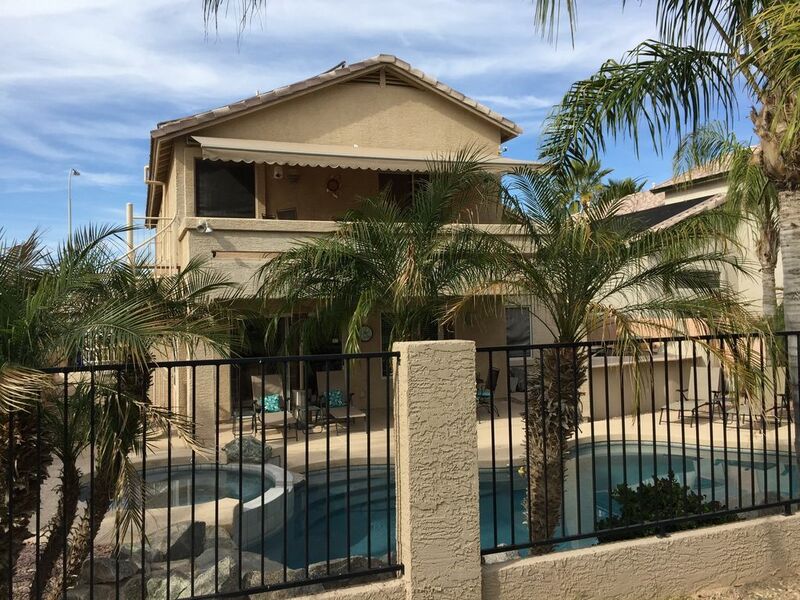 Becky was very easy to deal with and we have no trouble recommending this home to anyone....we will certainly stay here again on our next trip to Phoenix. Spa heating included in rental. Heating pool (87 degrees) additional fee of $175 per week winter and $150 per week spring/fall.